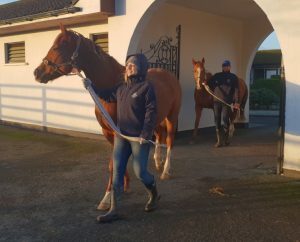 Nicholas Cope (IRE) and Sarah Collings (CAN) give you an insight into their second week here on the Irish National Stud Thoroughbred Breeding course. Monday at the Irish National Stud was right back to business as usual. With all thirty students having familiarised themselves with the farm and its goings on we begin our week in our respective yards. The foaling season at the Irish National Stud is well and truly underway with the arrival of four foals already. Students on the course have been on hand to welcome these foals. As part of our rotation, two students cover the night shift, assisting Lauren and Nicola in the farm’s Sun Chariot Yard. In the mornings the other students have the opportunity to work with these future racehorses in their early days of life. With the breeding season and the reopening of the Japanese Gardens and the Irish National Stud to the public just around the corner, preparations are ongoing to have the farm looking spick and span. It’s all hands on deck as the stallions are prepared for a busy season. While the stallions are getting ready, contractors are occupied with upgrading their working and living quarters. Improvements are being made to the farms covering shed and all new fencing is going up to keep both the stallions and visitors safe during the upcoming season. These are not the only preparations happening on the grounds at the moment as the farm’s draft is readied for the upcoming Goffs February sale. The consignment consists of an eleven strong team, all to be offered at the sale on the 5th and 6th of February. The farms fillies and mares will be available for inspection in barns R and S on the grounds at Goffs in the lead up to the sale. Aside from the practical side of things, this week we have had lectures organised each evening. We attended some very informative lectures from Sarah O’Dwyer of Troytown Greyabbey veterinary clinic on foaling. 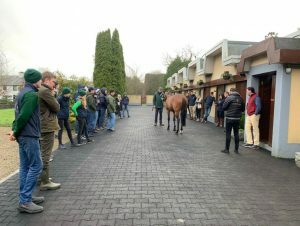 On Thursday all of us gathered to present an assignment on each of the stallions at the Irish National Stud. We were divided into groups and asked to prepare a speech as if we were selling a stallion nomination. Discussing the pedigree, progeny, race record and unique selling point, each group made their sales pitch. INS Stallion handlers, Paul and Tom, paraded the boys for us as CEO Cathal Beale and nominations and bloodstock adviser, Patrick Diamond, observed and gave feedback on our efforts. That evening Patrick gave us a lecture on the stallions, inviting us as students to go into further detail in discussing the pros and cons of the farms stallion draft. We were back in the classroom again on Friday for a lecture on the history of the Irish National Stud, from its foundation by William Hall Walker in 1900 to the Irish National Stud Act of 1946, and how it has expanded since.